I came to photography quite late in life. I have gravitated towards landscape photography because it allows me plenty of time for contemplation and I enjoy the times of solitude that it provides. I used to work in the video games industry and disappearing into the landscape was a great way to escape the fast paced, stressful work environment video games is. I don’t work in video games anymore I just disappear more often. I am an enthusiastic amateur who tries to fit photography round a busy and demanding job in my local hospital. I have discovered that I prefer intimate landscapes or low light, with a pinch of monochrome. The only way to grow is to practice and I have been taking at least one picture per week for the last 4 years. 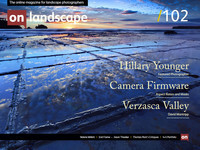 Landscape photographer based in Aberdeenshire. "The field is a field I passed every so often when out on a cycle. There is nothing exceptional about the field. It is on a slight undulating hill. You can see planes landing and taking off at Edinburgh airport from it. There isn't much else to say about it. I initially went out to record the field because it had barley planted in it, the heads were too heavy for the stalks and were all bending down. There was some interesting image potential with this sea of curves. After, I continued to visit the field to see how it changed through the seasons. Sometimes it can be quite hard to create a compelling image and other times I looked at other fields and wondered should I have chosen that field as it was much better looking at that point in time but I have been loyal and stuck with my original field. The field project is meant to last a number of years. I am currently one year into it." Many years ago I got bored with what I was achieving with a portable point-and-shoot camera, and did a C&G in Photography. When that camera died, I got lazy with a small digital camera that gave me holiday snaps but no more. I even bought a DSLR, but still that sense of boredom crept in again, tinged with frustration. So I decided to do a couple of courses and to work at the photography. Various websites opened my eyes, including this one, and showed me just how much more a photograph can be. Not just an image. I got an old camera and had it converted to Infra-Red, and then I did another course with that camera (thanks to Paul Gallagher). So we come to the portfolio. I thought that the course would take me to much more black and white (which I love), but instead it took me to woodlands. I have discovered a way of using limited palettes of colour, and how intimate landscapes that make me think and look again are so much more satisfying than the immediate "wow" of so much that is popular. There is so much more reward after working at something. The first image (Penny Rock woods) is the first, infra-red, picture that opened my eyes. The rest show the journey through the year from then spent discovering woodland both locally (Fineshade and Holme Fen) and further afield (Surprise View). The image from Holme Fen is not the most dramatic, but my favourite as I feel that I have captured some of what I felt that misty autumn morning. And I still feel the cold and stillness of the pre-dawn when I look at the snow on the boughs from the Peak District. I hope that the pictures can convey a little of this. This 4x4 of images I selected after a recent trip to Iceland. My last visit was in winter with much of this wonderful landscape covered in snow and ice. On returning this summer I was amazed at how varied the volcanic basalts and silicic rock colours and textures are, and the amazing contrasting greens and oranges of the colonising mosses and grasses. Even in diffused, often rainy, conditions the colours and contrasts are still extremely prominent making it a pleasure to shoot despite ideal weather and shooting with a telephoto was very rewarding picking out shapes and reliefs. These images reminded me most of my trip. I don't like using the term "project" any more as it makes it sound like there is going to be an end to it at some point, Id rather describe these as images I occasionally make of a local part of coastline when the mood takes me. These are all details taken in late evening mostly in autumn and winter months, I enjoy the atmosphere of being out in the cold up to my ankles in water examining the details of the rocks and the effect the waves meeting the shore have on them.